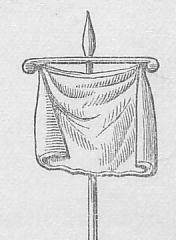 "The vexillium was a standard composed of a square piece of cloth fastened to a cross bar at the top of a spear, sometimes with a fringe all round, and sometimes fringed only below, [see here], or without a fringe, but draped at the sides, [see here]. When placed over the general's tent it was a sign for marching, or for battle. The labarum of the emperors was similar in form, and frequently bore upon it a representation of the emperor, sometimes by himself and sometimes accompanied by the heads of members of his family. [ ] That which Emperor Constantine bore was what, in his time, was the only recognized Christian emblem - the first two letters of our Lord's name - the Greek X and P. [see here]. The labarum was made of silk. The term is sometimes used for other standards, and its form may be recogized in the banners carried in ecclesiastical processions. The labarum, like the vexillium, had sometimes fringes with tassels or ribbons." See modern creations for re-enactment at <www.legionxxiv.org> and <www.larp.com> for more details. A special case must be Marcus Agrippa's flag, awarded by Augustus. This is mentioned in Suetonius' "The Twelve Caesars", I quote from the Robert Graves translation (rev. Michael Grant), issued in Penguin Classics, ch. 25 of 'Augustus': "Marcus Agrippa earned the right to fly a blue ensign in recognition of this naval victory off Sicily." I can provide more bibliographical info here but the interesting thing is to compare this version with others (and with the original text). See, for instance at <www.gutenberg.org> "The Lives of the Twelve Caesars", a Gutenberg e-text (translation Alexander Thomson rev. T. Forester): XXV. (...) "He presented M. Agrippa, after the naval engagement in the Sicilian war, with a sea-green banner." It is important to stress the fact, that this vexillum (flag) was obviously awarded as a military decoration, because in the sentences before Suetonius described the other military decorations that had been awarded (several crowns, collars etc.). There are other instances known of the awarding of a vexillum as military decoration to high-ranking officers . However, it is totally unknown, how this decoration was displayed, i.e. if the actual flag was openly displayed or if some miniature form was worn with the uniform, for instance. C. Suetonius Tranquillus: De Vita Caesarum. at <www.perseus.tufts.edu>. Charlton T. Lewis, Charles Short, A Latin Dictionary. at <www.perseus.tufts.edu>. As far as my limited knowledge goes, the word vexillum referred specifically to the flag carried by the Roman cavalry. If there was no other usage, would it not be reasonable to assume that this decoration was displayed in a similar manner? For example that he could have been preceded by a bearer carrying this caeruleun vexillum before him in processions or on parades like the triumph? Did he have one for this victory? Presumably we can only speculate at this distance in time unless some one can come up with a classical reference explaining the whole thing.